(1961) Brad Harris, Walter Reeves, Mara Berni, Brigitte Corey. WIDESCREEN. Take those inferior $5-$6 video copies from other companies and throw them into the dumpster. This is probably the best copy of this sword and sandal classic on the market. 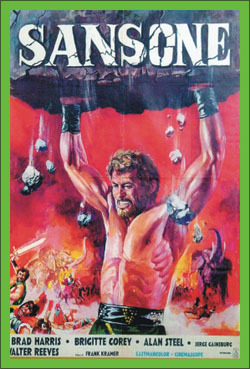 Samson attempts to restore a queen to her rightful throne. Harris is great in the title role. Only drawback is some occasional weak comedy relief, but overall this is a must for all fans of muscleman epics.